Due to a federal court decision, Mountain Valley Pipeline (MVP) has not been able to continue construction on some or all of the route since July 2018, especially in Jefferson National Forest (JNF) and adjoining areas. At issue now is the US Forest Service (FS) permit that ignored major weaknesses in MVP’s erosion control plan. The suit was brought by Sierra Club, Appalachian Voices, Wild Virginia, the Wilderness Society, Preserve Craig and Save Monroe. On July 27, 2018 a 3-judge panel of the US Court of Appeals for the 4th Circuit vacated MVP permits issued by the US Forest Service (FS) and the Bureau of Land Management (BLM). The court stated that the FS had “acted arbitrarily and capriciously in adopting the sedimentation analysis” accepted by FERC and ignored its own rules in doing so. Prior to approval, the FS had argued for months (as had many external experts) that the erosion controls proposed by MVP would contain about 48% of erosion. FERC accepted MVP’s claim that they could contain 79% (they originally said 85%!). That’s a big difference! As detailed in an earlier post on this site, FERC then issued a Stop Work order for the whole project but has since accepted a revised BLM permit and allowed MVP to resume construction except in the JNF and some intervening lands. The issue will return to the 4th Circuit at some point. 2. The project would cross two separated parts of Jefferson National Forest (Peters Mountain and Sinking Creek Mountain/Brush Mountain). Cross under the Appalachian Trail. 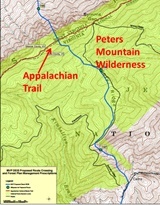 The MVP scar in West Virginia would be very visible from the AT as the trail follows the ridgetop of Peters Mountain for about 9 miles. This was obvious in a June 2018 site visit to the ridgetop with the National Park Service (NPS), FS, FERC, MVP and local AT staff and volunteers. Run immediately next to the Peters Mountain Wilderness, where there is also a large archeological site. Run along and across Mystery Ridge Road, the main access road for AT trail maintainers. Cross many tributaries of the New River. 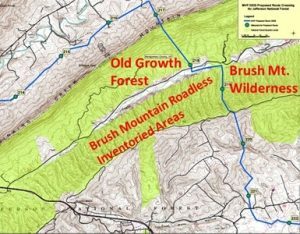 · Brush Mountain Inventoried Roadless Area (eligible for Wilderness status), immediately adjacent to Brush Mountain Wilderness. · Many tributaries of the North Fork of the Roanoke River. A core part of the FS mission is to protect the nation’s watersheds by preventing excess sedimentation. Water contamination and landslides are two major threats posed by erosion of the pipeline right-of-way (ROW), which has been denuded of the forests that previously covered it. The threats are especially acute in six High-Hazard Areas on the MVP route identified by the FS. The project would impact the watersheds of 3 rivers: the New, the James and the Roanoke. The area traversed by MVP is known as Three Rivers and includes the Great Eastern Divide – where streams flow to the Ohio/Mississippi (New), Chesapeake Bay (James) and Albemarle Sound (Roanoke). Steep slopes that frequently exceed 45 percent (as reported by MVP). Landslide-prone soils that could give way, causing a an explosion like the one seen recently at the new “best in class” Leach ExPress pipline. Location of Peters Mountain in the center of the Giles County Seismic Zone, which as experienced two earthquakes near the pipeline route in recent years, one of them reported to the US Geologic Survey by over 500 people. Dozens on smaller earthquakes could cause a catastrophic failure in the future. Higher risks whenever the ground is saturated with water, with risk factors reinforcing one another. ONE in Old Growth Forest on Sinking Creek Mountain and also on private property on uphill slope. ONE in Inventoried Roadless Area on Brush Mountain (it is likely that the other side of the mountain, on private property, is also High-Hazard (Sinking Creek and Brush Mountain shown segment of JNF shown on RIGHT). MVP later produced a study of potential erosion and sedimentation in JNF, a study that the FERC originally kept from public sight as a “Privileged” document. However, steady pressure from landowners and others produced its public release on July 26, 2016. All of the Best Management Practices to contain erosion proposed by MVP were for coastal environments and would never be used in mountain terrain. Realistic claims for containment were far lower: JNF studies showed standard practices (i.e. waterbars) 10%, seed 13%, fertilizer 12% and road surfacing 25% – and that this impact from MVP would need to be verified through study under the National Environmental Protection Act (NEPA). MVP essentially claimed that the only impact would be during construction; FS strongly argued that there would be a permanent, higher “new normal” level of sediment over the life of the project. This discussion went on for months, with the FS eventually agreeing – without explanation – that 79% of sediment could be contained. Judges in the 4th Circuit unanimously agreed that this made no sense. FS has not yet publicly responded to these concerns from the court, nor did they ever appear to apply a NEPA study to the erosion controls proposed by MVP. Landslides are a second major concern with poor erosion and sedimentation controls. Much of the MVP route is on extremely steep slopes with landslide-prone soil, and rainfall can cause slips and catastrophic landslides in such environments. The most recent example of this problem occurred on the brand new (in service January 2018) Leach Xpress pipeline exploded in Marshall, WV on June 7, 2018. It is now known than this failure was caused by a landslide and that the pipe itself was installed on a steep slope with landslide-prone soil. Federal safety administrators have notified this pipeline company that at least six other locations on the new pipeline have similar problems the require immediate repair. Is this our future? Side note: when RATC met with MVP and others in June 2017, an RATC volunteer asked the MVP Construction Supervisor if he could name a single successful large natural gas pipeline that was build in terrain like that of MVP, combining steep slopes, landslide-prone soil, an active earthquake zone, and the porous karst in the valleys. His hesitant answer: “Florida.” It is no wonder that the erosion control measures on this project are a disaster. 4. Recently released reports from the US Forest Service show dozens of serious failures in MVP’s erosion and sedimentation controls in JNF. They reinforce the original FS critiques that led to the 4th Circuit Court of Appeals stay on construction in JNF. Repeated failures of culverts, silt fences, J-hooks, water bars – often in the same general area over and over again. The failures impacted waterways (especially Craig Creek) and a large archeological site on Peters Mountain/Mystery Ridge. From March through May, ALL of the problems occurred on the access roads (Pocahontas and Mystery Ridge on Peters Mountain) being widened by MVP and heavily used by FS and MVP security. 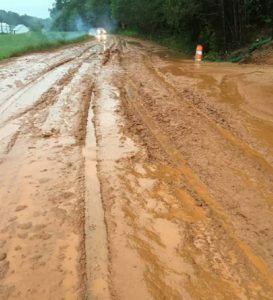 On March 3, sediment flowed 1,000 feet down Pocahontas Road, under a “failing erosion control sock” and into a stream. On April 4, sediment-laden runoff flowed 1,000 feet down Mystery Ridge Road ruts before dispersing in to vegetation. On June 23, sediment escaped 150 feet outside the LOD on the Brush Mountain side of Craig Creek. Even though construction halted at the end of July, there were 33 separate citations during the first six days of August – including “concentrated flow downslope for more than 200’ off of the LOD [Limits of Disturbance]” in the archeological site on Peters Mountain. (Note: we received an anonymous tip of a large landslide on Mystery Ridge during this time.) In the Craig Creek area, sediment ran into waterways 450 feet below the LOD. Three straight slope breakers failed, and the sump below them also failed. On August 20, there were 21 separate citations, all in the Sinking Creek Mountain/Craig Creek/Brush Mountain section. These included four reports of sediment in streams, completely overwhelmed sump pumps, and failing erosion control devices and silt fences. These failures led to the filing of a Noncompliance Report for 1.44 miles of the pipeline route in JNF (MP 218.58-220.02, including private property on Craig Creek Road) allowing MVP to clean up the mess on foot. 5. The FS recently approved an MVP plan for Winter 2018-19 that required MVP to plant seed on denuded areas and does not allow any construction or burying of pipe. MVP had proposed burying pipe in the ground to prevent erosion! During the Vietnam War, an American commander famously reported that he had to destroy a city in order to save it from insurgents. MVP and FERC have adopted a similar approach to erosion control since the July federal court ruling, arguing that the best way to protect sensitive environments is to lay and bury pipe as fast as possible. Leave downed trees in place on the Peters Mountain/Mystery Ridge segment and monitoring and containing erosion. Stabilize the Sinking Creek/Craig Creek/Brush Mountain section by stabilizing or removing pipe, laying mulch and seeding bare ground by October 15, installing additional erosion controls if needed and monitoring and controlling erosion. MVP agreed to the FS provisions a few days later, and the FERC concurred on September 28, 2018. Construction is halted in the JNF, there are still many court cases to be heard, and the FS has not responded to the vacated permit by explaining their acceptance of MVP’s clearly mistaken erosion and sedimentation estimates and plans. Stay tuned!